The Phoenix Suns travel to Sacramento to face the Kings on Sunday afternoon. The Suns erased a 21-point deficit in their win over the Kings on January 8th. Kelly Oubre Jr. tied his career-high with 26 points. The Suns and Kings have split the first two of four meetings this seasons. Their initial meeting on December 8th was the first game in NBA history with two players born in The Bahamas with Deandre Ayton and Buddy Hield. The Suns hold the all-time record against the Kings with a commanding 135-93 series lead. On Friday, Oubre finished one-point shy of his career-high with 25 points as he grabbed a career-high 12 rebounds for his third career double-double and second as a Sun. Since New Year’s, Oubre joins Ayton as the only teammates and two of just nine players in the NBA averaging at least 15 points, one block and one steal per game. The other seven players are James Harden, Anthony Davis, Giannis Antetokounmpo, Karl-Anthony Towns, Rudy Gobert, Andre Drummond, Jusuf Nurkic. Oubre has scored in double figures in a career-long 16 straight games. Over that span he is averaging 18.3 points on 44.8 percent shooting with 5.7 rebounds, 2.1 assists, 1.6 steals and 1.2 blocks. Since joining the Suns, Oubre is averaging 1.6 threes, 1.1 blocks and 1.2 steals. In Suns history, only two players have averaged at least one of each for a season (Shawn Marion and Clifford Robinson). Mikal Bridges reached 80 career three-pointers in his 57th career game on Friday. It was the fewest games to reach 80 in Suns history (passing Wesley Person’s 61). Jamal Crawford has 19,201 career points and is just one-point shy of former Suns forward and FOX Sports Arizona analyst Eddie Johnson’s career mark of 19,202 career points. Johnson currently holds the mark for the most points in NBA history by a player never selected to be an NBA All-Star. 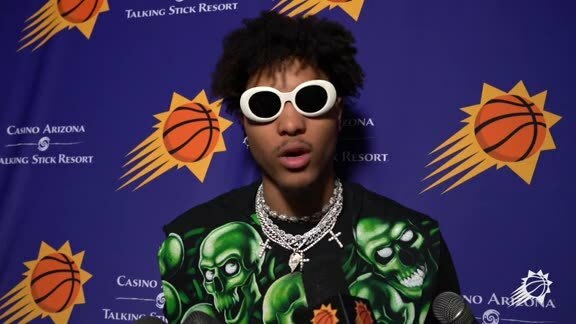 End of Season Interviews 2018-19: Kelly Oubre Jr.